The two leaders had a candid and in-depth exchange of views on the current development of China-DPRK relations and the situation on the Korean Peninsula. Xi Jinping (right), general secretary of the Central Committee of the Communist Party of China and Chinese president, holds talks with Kim Jong Un, chairman of the Workers' Party of Korea and chairman of the State Affairs Commission of the Democratic People's Republic of Korea, in Beijing, capital of China, on June 19, 2018. Xi Jinping, general secretary of the Central Committee of the Communist Party of China and Chinese president, held talks with Kim Jong Un, chairman of the Workers' Party of Korea (WPK) and chairman of the State Affairs Commission of the Democratic People's Republic of Korea, in Beijing on Tuesday. They agreed to safeguard, consolidate and develop China-DPRK relations, and jointly push forward the sound momentum of peace and stability of the Korean Peninsula to make a positive contribution to safeguarding world and regional peace, stability, prosperity and development. Xi said that China was pleased to see the important summit between Comrade Chairman and US President Donald Trump in Singapore achieve principled consensus and positive results in realizing the denuclearization of the Korean Peninsula and establishing a lasting peace mechanism on the Peninsula. "China speaks highly of the summit," Xi said. Comrade Chairman's visit to China showed the great importance he attaches to the strategic communication between the two parties and two countries, Xi said, expressing his appreciation to Kim. 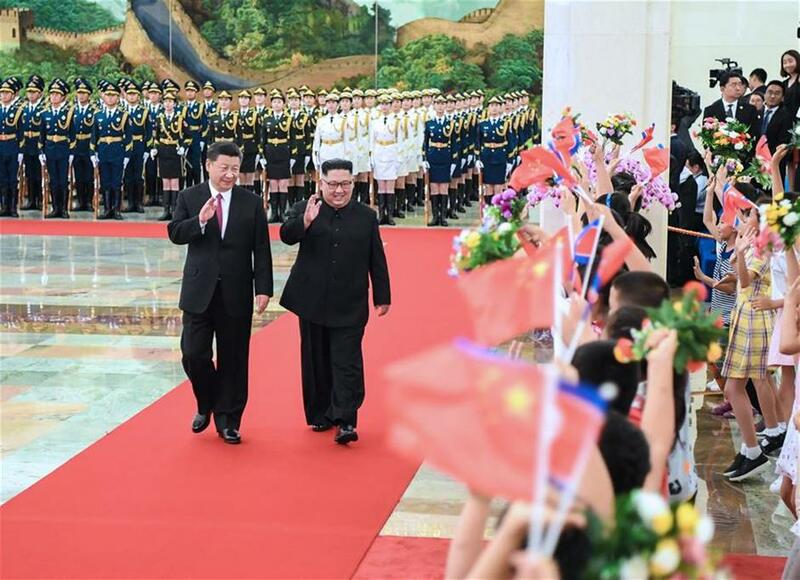 Xi stressed that he and Kim had met three times in less than three months, which pointed out the direction for the development of the relations between the two parties and the two countries, and opened a new chapter in the development of China-DPRK relations. "The CPC and the Chinese government attach great importance to China-DPRK friendly cooperative ties," Xi said. "No matter how the international and regional situations change, the firm stance of the CPC and the Chinese government on consolidating and developing the relations with the DPRK remains unchanged, the Chinese people's friendship with the DPRK people remains unchanged, and China's support for the socialist DPRK remains unchanged," he said. Xi Jinping(left), general secretary of the Central Committee of the Communist Party of China and Chinese president, holds a welcoming ceremony for Kim Jong Un, chairman of the Workers' Party of Korea and chairman of the State Affairs Commission of the Democratic People's Republic of Korea, ahead of their talks at the Great Hall of the People in Beijing, capital of China, on June 19, 2018. 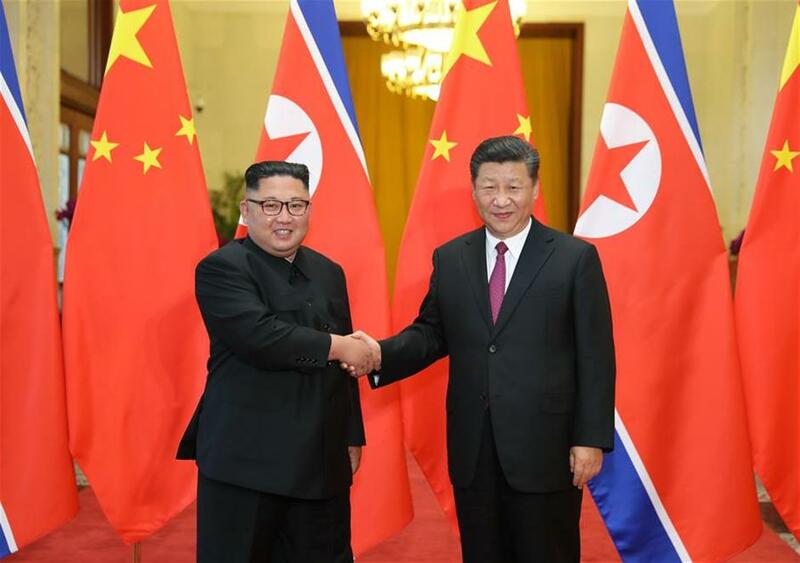 Xi voiced his willingness to work with Kim to continue implementing the important consensus reached by both sides, and promoting the long-term development of China-DPRK relations in a healthy and stable way, to benefit the two countries and the two peoples. This year marks the 40th anniversary of China's reform and opening-up policy. Xi said that since the reform and opening-up, the Chinese people have been courageous to carry out self-reform and innovation, on the basis of the national conditions and having the whole world in view, and have explored a development path suitable for China's national conditions. "We are happy to see that the DPRK made a major decision to shift the focus to economic construction, and the development of the DPRK's socialist cause has entered a new stage in history," Xi said, adding that China supports the DPRK's economic development, the improvement of people's livelihood, and its development path that accords with its national conditions. Kim said he was very happy to meet with General Secretary Xi Jinping again in a short period of time. He stressed China is DPRK's great friendly neighbor, and Comrade General Secretary Xi Jinping is a great leader who is greatly respected and trusted by the DPRK people. Kim said he appreciated the sincere friendship of and valuable support from Comrade General Secretary Xi Jinping and the CPC, the Chinese government, and the Chinese people, to himself, the WPK, the DPRK government, and the DPRK people. "I will guide all WPK members and the DPRK people to earnestly implement the important consensus reached by Comrade General Secretary and me, to lift the unbreakable DPRK-China relations to a new level," Kim said. Xi said for a period of time, with joint efforts of parties concerned, the Korean Peninsula issue had been put back on the right track of seeking settlement through dialogue and consultation, and the situation on the Peninsula was developing towards peace and stability. "Comrade Chairman has made positive efforts for realizing denuclearization and maintaining peace on the Peninsula," Xi said. On the recent DPRK-US summit, Xi said it marked an important step forward in the political settlement of the Korean Peninsula nuclear issue. He called on the two sides to implement the outcomes of the summit, and parties concerned to make concerted efforts to advance the peace process. 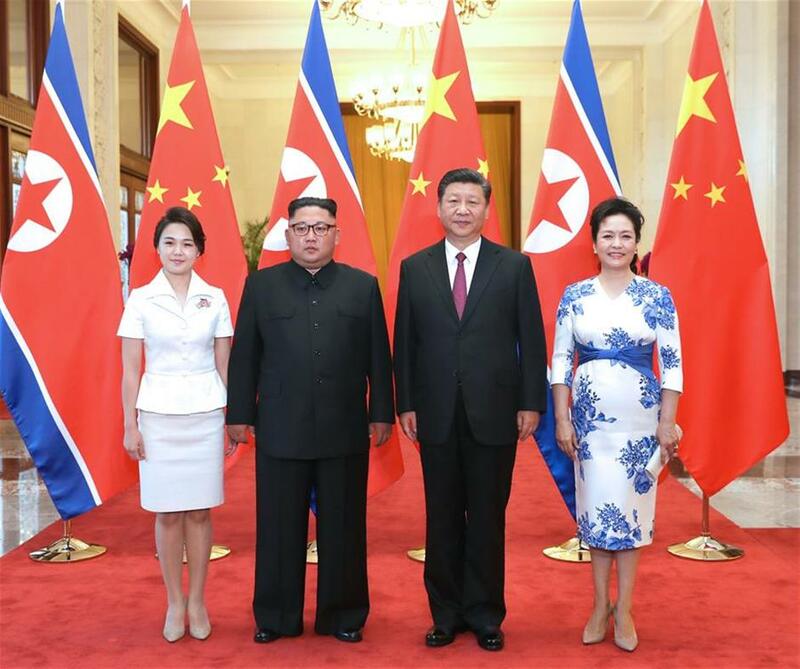 Xi Jinping (second right), general secretary of the Central Committee of the Communist Party of China and Chinese president, and his wife Peng Liyuan (first right) pose for photos with Kim Jong Un (second left), chairman of the Workers' Party of Korea and chairman of the State Affairs Commission of the Democratic People's Republic of Korea, and his wife Ri Sol Ju at the Great Hall of the People in Beijing, capital of China, on June 19, 2018. Xi Jinping held talks with Kim Jong Un here on Tuesday. China will continue to play a constructive role to this end, Xi said. Kim said the DPRK-US summit had achieved positive results in line with the interests of concerned parties and the expectations of the international community. "If the two sides can implement the consensus of the summit step by step solidly, the denuclearization of the Korean Peninsula will open up a new and important prospect," Kim said. He said the DPRK greatly appreciated China's important role in promoting denuclearization of the Peninsula as well as in maintaining peace and stability on the Peninsula. "The DPRK side hopes to work with China and other concerned parties to promote the establishment of a lasting and solid peace mechanism on the Korean Peninsula, and make joint efforts to achieve lasting peace on the Peninsula," Kim said. Before the talks, Xi held a welcome ceremony for Kim at the North Hall of the Great Hall of the People. After the talks, Xi and his wife Peng Liyuan held a welcome banquet for Kim and his wife Ri Sol Ju, and watched an art performance together.